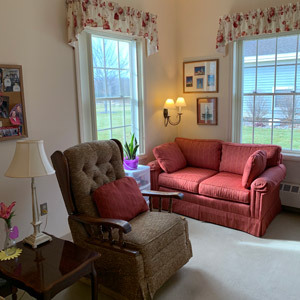 Each apartment is designed for comfort, privacy, and safety. All apartments include an emergency call system, security and fire detection sensors. 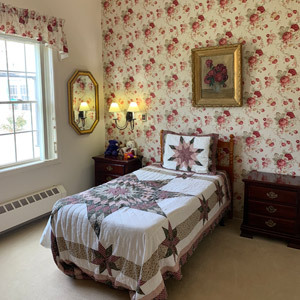 The apartments are wheelchair and walker accessible and include light switches positioned relatively lower on the walls and electrical outlets positioned relatively higher on the walls. Each apartment has a private bathroom with a walk-in shower, shower seat, grab bars, and emergency pull cord. 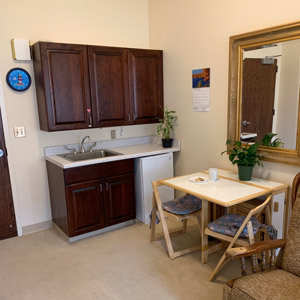 Each apartment also has a kitchenette which features a sink, counter, and spacious upper and lower cabinets. The One-bedroom apartments includes a refrigerator as well. *All apartments are large enough to accommodate each resident’s treasured possessions. 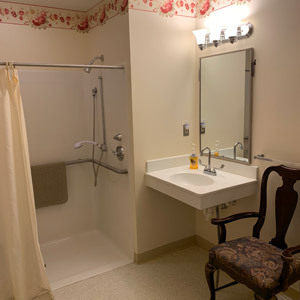 All units have a private bathroom with walk-in shower, shower seat, grab bars and emergency pull cord. A kitchenette features a sink, spacious upper and lower cabinets.